Metropolitan Police in the UK released surveillance footage on Tuesday that shows a person of interest in an incident that occurred on May 5. 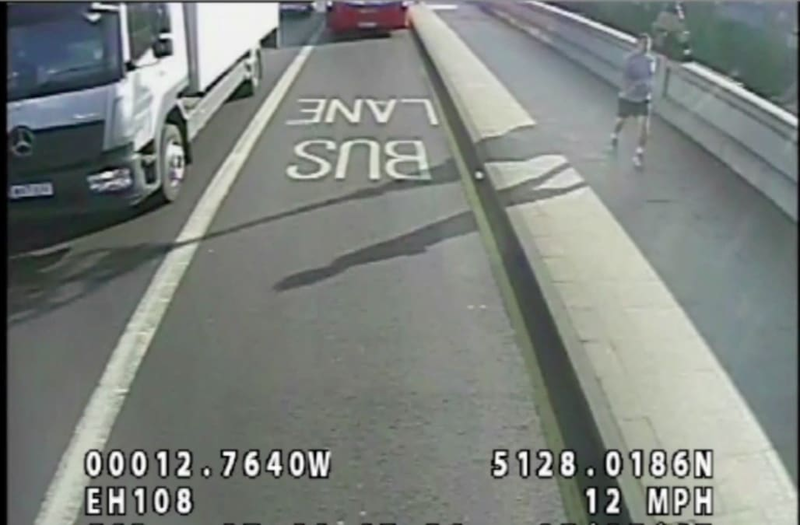 According to the authorities, the male jogger seen in the footage apparently pushed a woman, perhaps inadvertently, in front of a bus in west London. A news release notes, "the 33-year-old victim was walking across Putney Bridge on the east side heading towards Putney Bridge Tube Station when [the] jogger knocked her over into the road and into the path of an oncoming bus, which narrowly missed hitting her." A number of passengers then rushed to the woman's aid, who fortunately suffered only minor injuries. Authorities also note, "About 15 minutes later the jogger came back the other way across the bridge. The victim tried to speak to him but he did not acknowledge her and carried on jogging." Sergeant Mat Knowles, the investigating officer, said, "The victim was put in extreme danger when she was knocked into the road. It was only due to the superb quick reactions of the bus driver that she was not hit by the vehicle." The man they seek is described as white, in his 30s, with brown eyes and short brown hair.